Home → Weatherization → Weatherstripping → Schlegel Q-Lon Replacement Gasket Door Weatherstripping 86 in. 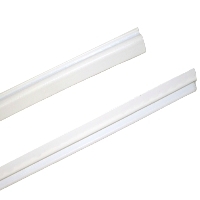 This replacement qlon weatherstripping from Schlegel is of high quality, used to reduce air infiltration and energy loss through the sides and top of exterior doors. The weatherstrip is made of urethane foam that is polyethylene-clad. It measures 86-inches in length, and is available in either a bronze or powder-coated white color. Do you carry the Q lon weather stripping mounted on a aluminum frame? Also I have 10 foot double outside doors. Can I get two 10 foot long piece with wood, aluminum, or pvc frame? Or do I have to piece it together with the 3 foot strip? Yes, we carry the QLon weather stripping mounted on an aluminum carrier. Our item# 10130.2 in white, and our item# 10130.1 in brown. One kit includes two 85 inch side pieces and one 37" header piece. This is the only size we sell.